I always shoot on the dangerous line between showing too much and not showing enough. I try to work as if I were on a tightrope with a precipice at either side. […] One day I said ‘Cinema is the art of showing nothing.’ I want to express things with a minimum of means, showing nothing that is not absolutely essential. Among the people of my acquaintance who know the most about film, I doubt there are many – if any – who do not consider Robert Bresson to be the greatest of all living filmmakers. Robert Bresson is a self-conscious Catholic with an exceptionally austere conception of film-making. While I admire, without exclusively preferring, the art of multum in parvo, I have not always been convinced that Bresson’s close-reefed sailing is inevitable to the channels he has picked. And he obviously spent much of that time thinking about film, to which his fascinating little book, Notes sur le cinématographe, attests. Far from doing what every other major filmmaker of the period had done – namely, accepting film as the gloriously impure art that it is – he set about systematically ridding his work of all elements not intrinsic to it – elements borrowed from theatre or photography – while curiously hanging on to literary trappings like fictional narrative and characters. (5) Inevitably, like many artists who spend more time thinking about their work than actually working (Giorgio de Chirico springs to mind (6)), Bresson was sometimes guilty of talking a better film than he ever executed. Between Journal d’un cure de campagne (Diary of a Country Priest, 1951) and Pickpocket (1959), Bresson had obviously made up his mind. In between them is what is generally agreed to be his masterpiece, Un condamné à mort s’est échappé où le vent souffle où il veut (A Man Escaped or: The Wind Bloweth Where it Listeth, 1956), a film which is a glorious instance of the true marriage of form and content. Not a single scene – not a frame – could be removed without marring the overall impact of the film. Perhaps Bresson himself noticed his mistake and turned (again after a five-year interval) to a much more supple approach in two films released in 1966 and ’67: Au hasard, Balthazar and Mouchette. While continuing to maintain a tight grip of his actors, both films possess enough lyricism and a regard for the creatures inhabiting his constricted frame to make their inexpressiveness somewhat more acceptable. The relative success of these films enabled Bresson to make five more films before his retirement on completion of L’Argent (1981). His reputation was secure – if still highly specialized. His way of making films, however, never caught on. But his films will last as long as any, though some as only illustrations of a quixotic and actually quite arbitrary extreme in film form. There are several elements of Bresson’s style that are objectionable and one that is entirely spurious. For how can anyone embrace his views without being prepared to reject the work of every other filmmaker? (11) Paul Schrader has called Bresson’s films “transcendental” (12) in their emphasis on something other than what is onscreen. This “something other” is what Bresson has called the “soul”. And it is precisely here that I must declare myself unqualified to judge Bresson’s success or failure to capture the souls of his actors, and most critics – especially the insistently Leftist ones – would do well to follow. Perhaps some mystic might be capable of recognizing one. I, for one, remain sceptical of such things – along with ghosts, angels and leprechauns. Having said this, however, I must admit to detecting a certain evanescent quality in his later films, from Pickpocket on, which may or may not be the result of his exhaustive technique. When you starve a film of every means of expressiveness, the slightest breath of something authentic or genuinely emotional can seem exaggeratedly moving. (13) If that is what Bresson is after – momentary glimpses of true feeling, sparks in a general drama of nullity and numbness – it hardly seems worth all the effort. When people accused his films of expressing nothing, of being empty, Bresson insisted that it was their fault. He would merely say that it is what his films elicit in the viewer that matters. The critics – and there are many – who swallow Bresson’s work whole are, I believe it is safe to say, guilty of collusion in an elaborate hoax. The fact remains that there is no common ground on which sceptics and believers can meet. The sceptics will continue to insist that Bresson’s best films are those that approximate most closely to the very conventions of filmmaking that he spent his career so strenuously avoiding. The believers insist that, while those films are fine in themselves, only his later, more arcane films represent him most purely. While I can admire Bresson’s single-mindedness in pursuit of his own ideas, seeing things that are not there (or at least pretending to) cannot possibly do his work – or that of any other great filmmaker – the justice it deserves. Bresson is one of Film’s great mannerists – a reactionary to the school of naturalism introduced after World War II by the Italian neo-realists. While sharing their use of non-professional actors and real locations, his use of them betrays the very reality they might otherwise have represented. In effect, Bresson is anti-modernist, which is why it is so surprising to find him being praised most highly by critics who wear their politics (always Leftist, of course) on their sleeves. Would someone so profoundly neo-Catholic be comfortable in the company of critics whose political philosophy begins with a denial of most of his ideas? Critics who have probably never prayed profess that they find Bresson’s late films profoundly moving. Are they closet æsthetes? When J. Hoberman writes that “Bluntly put, to not get Bresson is to not get the idea of motion pictures”, he is clearly speaking – quite snobbishly – to a large number of critics who don’t “get” Bresson. When he then adds that “it’s to have missed that train the Lumière brothers filmed arriving at Lyon station 110 years ago”, he is being silly. It is for the work of Bresson that 110 years of realistic film that started with the Lumière Brothers have passed utterly in vain. Bresson’s work does not belong in that tradition at all. No stranger to obfuscation, Jonathan Rosenbaum even claims that it is impossible to fully appreciate Bresson’s films anywhere outside a movie theatre – on DVD, that is. Even the finest home theatre systems cannot restore what is lost in the transfer. So all of us who have to resort to DVD must wonder why there is nowhere a sense of anybody’s “soul” on their pristine Criterion DVDs – prints that are finer than anything to be found in theatres. Is something lost in the grain? Should I adjust the contrast on my television to see them? From an interview with Charles Thomas Samuels, in Encountering Directors (New York: Da Capo Press, 1987). Jonathan Rosenbaum, “The Last Filmmaker: A Local, Interim Report”, reprinted in James Quandt (Ed. 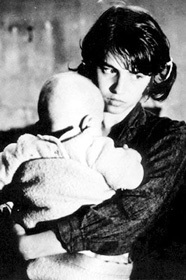 ), Robert Bresson (Ontario: Cinémathèque Ontario, 1999). Vernon Young, On Film (New York: Quadrangle Books, 1972), pp. 211-212. One “literary” element – plot – is necessarily lacking in his films, since Bresson eschews causality of any sort. The painter Giorgio de Chirico “fathered a scuola metafisica on the verge of World War I”. Bresson was also a painter, but of what school has not been divulged. In 1954, François Truffaut published an essay, “Une Certaine Tendance du Cinéma Française”, which called for “La Politique des Auteurs”. Interview with Rui Nogeira, 1976. Reprinted in Quandt. Whether Bresson would admit it or not, his “models” are actors, paid to play roles in a fictional story. “He dismisses [Michelangelo] Antonioni as a mere photographer and [Ingmar] Bergman as someone wrongly dependent on rhetoric.” Samuels, “Bresson’s Gentleness”, in Mastering the Film and Other Essays (Knoxville: University of Tennessee Press, 1977), p. 160. Paul Schrader, Transcendental Style in Film: Ozu, Bresson, Dreyer (New York: Da Capo Press, 1972). I’m thinking of moments like the unexpected appearance of the bateau-mouch in Quatre nuits d’un rêveur (Four Nights of a Dreamer, 1971) with the sensual saudade-singer.